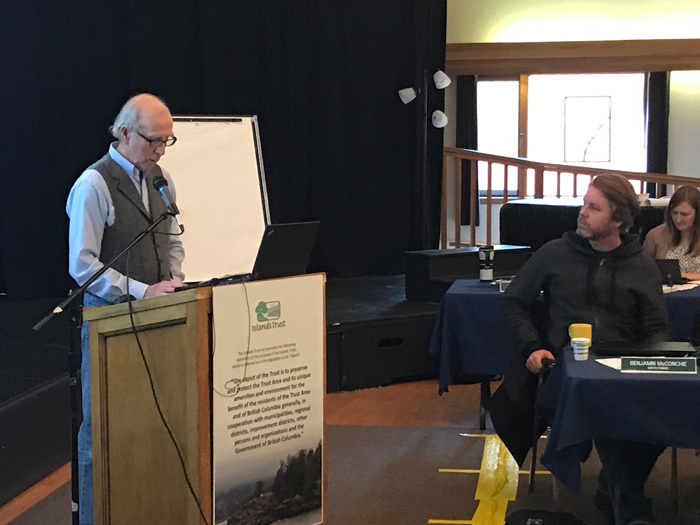 Salt Spring resident Peter Lamb, left, addresses Islands Trust Council on Gabriola Island last Wednesday, as North Pender trustee Ben McConchie listens. Islands Trust Council declared a climate emergency by unanimous vote during the quarterly meeting held on Gabriola Island last week. The March 13 motion was sponsored by trustees Deb Morrison of North Pender Island and Scott Colbourne of Gabriola. Along with the declaration, seven related action points that lay out steps for planning staff and Trust Council chair Peter Luckham to take on in the coming year were approved. They include advocacy work with senior governments and policy amendments. Introducing the motion, Colbourne described the initiative as being “science based and justice rooted.” He explained the emergency concept followed on actions of other local governments around the world and in the region, including the Capital Regional District and the cities of Vancouver and Victoria. “They’re calling on senior levels of government to give them the resources to deal with this . . . and they’re also finding ways to use their resources differently to address climate change. So part of passing an emergency declaration is signing on to a movement that’s building around the world, and part of it is asking ourselves with the Trust what that can look like,” Colbourne said. Responding to a question on how to communicate the issue to people who might not be as convinced of its gravity, Morrison said it was important to move past language about believing in climate change to try to get people to accept the science. “The data argument is not going to be the one that we use to communicate with our communities. It’s going to be storytelling about the local issues and what we are facing. The erosion on our shores, our sea level rise, our building codes: those local things that matter to us are going to be what gets through,” Morrison said. Salt Spring resident and former trustee Peter Lamb gave a delegation at the meeting urging the council to pass the declaration. He came armed with a petition signed by 600 people representing every island within the Trust area as well as some other communities. “There can be no doubt that we are indeed facing a climate emergency, defined as ‘a cascading breakdown of the climate system due to unsustainable extractive economic and social forces, posing an existential risk to humanity and life on Earth,’” Lamb said. Lamb argued that making the declaration would not be enough, though, and said the Trust needed to recommit its budget in order to designate staffing resources. He suggested a program in which BC Hydro will fund 50 per cent of the cost to hire a community energy manager over two years. While no new funds were added to the current budget to directly address the priority, Trust administrative services director Julia Mobbs explained the 2019-20 financial plan has enough flexibility to accommodate climate change-related work. As well, amendments can be made to shift money between departments if necessary, she said. Another suite of motions that was approved at the quarterly session may provide support for climate change mitigation and prevention. Council gave unanimous support to a recommendation from the Local Planning Committee to implement the Coastal Douglas-fir Toolkit across the Trust area. This will give local trust committees the impetus to start developing the tools available to protect intact forest areas. For more on this story, see the Mar. 20, 2019 issue of the Gulf Islands Driftwood newspaper, or subscribe online. At least they didn’t ignore the contribution to climate change caused by the destruction of our coastal rain forests.